So, the consumer preview of Windows 8 launched two days ago. I took some time yesterday to sit down and tinker with the Xbox Live features found within the application. 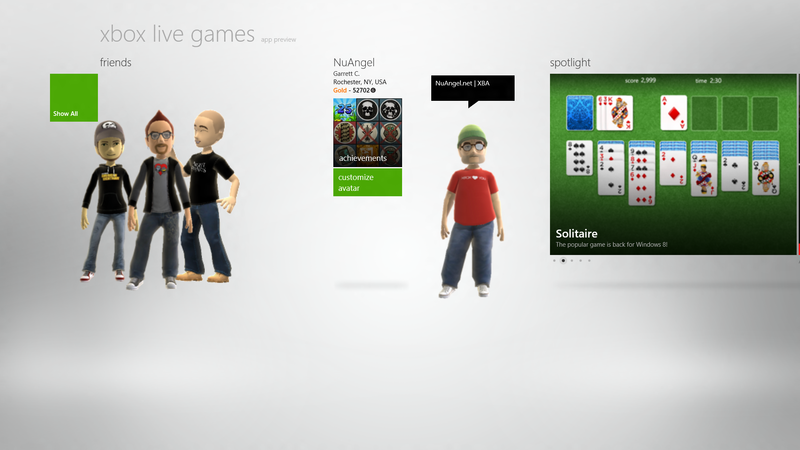 Let’s begin with the “Xbox Live Games” tile seen on the new Start Menu of Windows 8. When you enter the new desktop app, you’re greeted with what has become a familiar scene. Thle Xbox Live Metro UI landscape. It’s a screen that you can neatly scroll left and right on, and see your friends, recently played games, unlocked achievements, and even current promotions for Games for Windows Live (what it called strictly “Windows Game Marketplace”) or Xbox Live. From the friends list, can easily view all of your friends, online or off, as well as their profiles and “friends of friends.” Strangely absent are any messaging features. I can understand chat, but even the Windows Phone 7 application has messaging abilities. Still, it’s nice to browse your friends, and even their achievements. I scrolled through the app until I found a series of Xbox Live games, including tiles I could click on. This had me interested. What did they do? I clicked on a tile for Call of Duty: Black Ops. It gave me all of the marketplace details about the game, along with the option to “buy” or “Play on Xbox.” Two noteworthy things: notice the dropping of “360” from the console name. I wonder if this is a hint of things to come – that the “Xbox” platform is going to become more ubiquitous and less console driven. Could “Xbox” as a gaming console be on the decline, whereas “Xbox” as a gaming and multimedia platform be the next direction? Almost to be thought of as an Operating System rather than a console brand? Don’t think “Xbox 360” or “PlayStation 3” – but rather, think Android. It’s a brand, not necessarily a specific thing. A second item worth noting comes from the “Play on Xbox” button and what it actually does. When clicked, it launches another Windows 8 App known as the Xbox Companion app (also available on Windows Phone 7, currently). This app allows you to interact with your Xbox 360 console to some extent, provided it is already on and you are signed in to Xbox Live with your Gamertag (the one associated with the same LiveID you have bound to your Windows 8 logon, if you went that route!). I then switched my input (my PC and my Xbox 360 are both hooked to my TV) to see what was on the screen of my Xbox 360. Since I do not have the full version of Black Ops downloaded to my console, or the disc in the tray, my Xbox had kindly loaded up the screen where I could purchase and begin downloading the full version of Black Ops on my Xbox 360. In the end, the Xbox Companion app has many of the same features as its Windows Phone counterpart, albeit a much stranger interface on a widescreen monitor. The beta team was kind enough to include a few games for Windows 8 Consumer Preview. I headed to the market and downloaded cut the rope – which plays surpsingly well with a mouse. 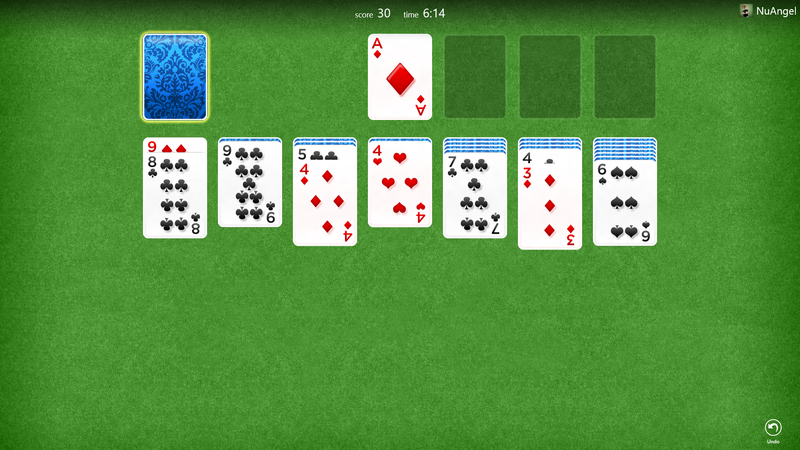 What doesn’t play well with standard “PC” hardware is the pre-loaded version of Solitaire. The biggest problem was overcoming the control scheme. It’s a very strange feeling to “press and hold” with a mouse – it took me a while to figure out why I was unable to drag the cards in this simple game. Once I got the hang of it the game was as simple as one would expect. To quit and re-deal a new hand, you simply needed to right click and it would pop up the black sub-menu at the bottom of the screen. The strange thing, however, is that “Cut the Rope” is not considered an “Xbox Live” game, rather just a game-app much like many on Windows Phone 7. Solitaire is considered to be an “Xbox Live” title, but has absolutely no “Live Enabled” features which I was expecting to “preview.” No leaderboard, no achievements, and even though it offered me the ability to sign in by clicking a link in the upper right (and subsequently showing my gamertag in the upper righthand corner of the screen, as in the screenshot above). However I had no way of accessing my friends list, changing my online status, viewing achievements, or pretty much any other “Xbox Live” feature. I get that this is a preview, but it gave me less of an experience than any already-existing Games for Windows Live title out there gives you today! Download the Windows 8 Consumer Preview Beta now!